Monad (from Greek μονάς monas, "unit" from μόνος monos, "alone"), according to the Pythagoreans, was a term for Divinity or the first being, or the totality of all beings, Monad being the source or the One meaning without division. 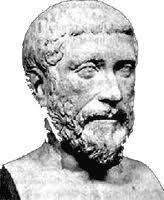 For the Pythagoreans, the generation of number series was related to objects of geometry as well as cosmogony. According to Diogenes Laertius, from the monad evolved the dyad; from it numbers; from numbers, points; then lines, two-dimensional entities, three-dimensional entities, bodies, culminating in the four elements earth, water, fire and air, from which the rest of our world is built up.